Discussion in 'Family Tree Analyzer' started by jorghes, May 20, 2017. I've noticed that recently my Lost Cousins facts listed with the country "USA" are no longer recognised as Lost Cousins facts when read by Family Tree Analyzer. I don't really want to have to go through my entire FTM 2017 file - which is a program which prefers "USA" over something like "United States" and I've spent a lot of time changing all the references over. Is this just a bug? Is there something I need to change so that my US census facts appear in the Lost Cousins list on FTA rather than as "LC facts missing a country"? Is anyone able to help with this? Or able to explain it?? I think it's a bug and Alexander is aware. Oh good, I was wondering since I hadn't had a response. I used to raise questions about FTA via this Forum but it is possible for such posts to be missed. In order to avoid such oversight, Alexander asked for any unanswered questions to be raised as issues at http://ftanalyzer.codeplex.com/ so that everything appears in one place and is easier for him to manage. I'm guessing this issue is no longer a problem with v6.1.1.0? www.ftanalyzer.com/install is place to find latest version. Unfortunately it is still a problem for me. I have updated to version 6.1.2.o and I still have the problem that FT Analyzer isn't recognising "USA" as a country. I haven't managed to post the error in the forum (I probably meant to and forgot... or I could have an still forgot). Can you post a snapshot of the error that you're getting? I have 2 (non-blood) relatives recorded in the 1880 US census which I have entered into LC. However, I do not know the required format of the census reference that FTA requires so have not placed any such information within my tree for inclusion in any Gedcom file. I intend to add that information when I know just what format is required. I also notice that LC My Ancestors page shows these entries as being from "United States" census so that is probably what FTA is expecting as the country specification. If Alexander is asked nicely, it would probably be a fairly simple adjustment for FTA to accept "USA" as an alternative. It doesn't raise an error as such, but here are three shots of the sort of thing I'm seeing. So looking at your figures, I can see the issue is not to do with the USA, but I believe it is to do with the US Censuses. Looking at your figures from Lost Cousins it says you have entered 340. FTA is analysing the data in your Family Tree, and it appears that you have not added the US Census ref's into your tree, and therefore FTA has determined that 288 have no country. I add all the census references into my tree first, then add LC facts and onto the Lost Cousins website. I haven't gone back and removed all the 1940/1880 US census facts from my tree, they are the same there as they have always been. What is not the same, is the way it seems that FTA reads those facts. Up until a couple of updates ago, (and this occured prior to the move), FTAnalyser showed me that I had a collection of census data and matched LC facts in my tree for the US censuses. And then one day I updated the program, and all those matched references vanished, and they were placed instead in the "LC with no country" box instead. I spent days when I first started using FTA carefully making sure that for every census entry and LC entry on the website there was a matching entry on FTM, and for all that work to be consumed is obviously a little trying. I haven't changed a thing in my tree since, because I can't figure out what the hell is going on and why suddenly all the references have been wiped when I put it through FTA. Here are the references as they appear in my online tree (my FTM is on my home Mac so I can't access it at the moment and the LC facts don't appear as I have them as a private fact.) 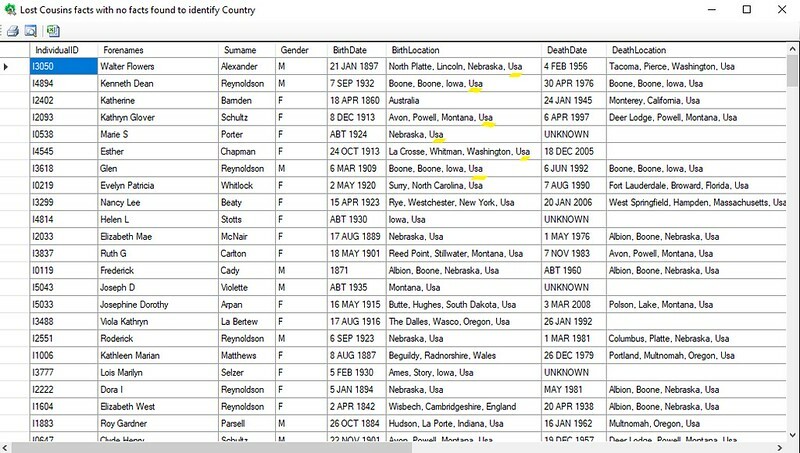 This is the 1940 US Census entry on my Ancestry online tree (as it syncs with my FTM), for the very first individual on the list above (Walter Flowers Alexander) who is not registering as having a recognisable country on his LC fact (which has exactly the same location on the LC fact as the census fact below). Up until a couple of updates ago, (and this occured prior to the move), FTAnalyser showed me that I had a collection of census data and matched LC facts in my tree for the US censuses. This is increasing looking like FTA no longer recognizing the format of the census references appearing in your Gedcom file. Is that format documented anywhere for FTA? It is obviously different for each country and possibly for each census. If that is the case, why would it still recognise all the same facts as listed for the other censuses? It recognises the data for the English/Wales, Scotland, Canada and Ireland data - just not that for the USA. That was why I queried whether or not it was recognising the "USA" part as a country. That was why I queried whether or not it was recognising the "USA" part as a country. Where does "USA" appear in the accepted format of the census reference? I don't believe that "England" needs to appear in the references for that country. I believe that FTA generally determines the country from the format of the reference. If the format does not match what FTA expects then the country is not determined, unless inserted directly into the Gedcom file for the Lost Cousins event. That is why I have not yet added census references for my two relatives in the 1880 US census because I do not know what the required format is. Please can the FTA documentation (and program) be amended to include the required formats for each census within each country? At one time, only the format used by Ancestry for the England/Wales 1841/1881/1911 censuses was valid but subsequently there have been slight variations allowed, particularly when extracting this information from Notes. I think Bryman is correct. It appears that FTA doesn't recognise the census ref anymore for US censuses. That makes sense, thank you Bryman! But I can't be the only person who has this problem, unless of course it is only the Ancestry format of the two US censuses that FTA has stopped recognising. I do not manually enter my residence facts, which is naughty of me! Odd. USA should definitely be recognised as a country, indeed there are many variants with and without dots and spaces that are recognised too. Census references are not required at all for the Lost Cousins report to work. If they are present but you have no census fact then it will assume there should be a census fact and create one as appropriate. However all that it needed is a 1940 census (or residence) fact. What’s the format that is failing to be recognised? These are the current formats. I haven't dug deep enough to find the string used, but I create my GEDcom using FTM. I can always try to find it, but to be honest I'm unsure of how to do so. Previously to FTM, I add census details using Ancestry usually.